We’re excited to share with you another Canadian home designed by the architects at Unit 7 in Winnipeg. They are known for their modern and timeless approach to design. In this home, we’ll see how they created brilliant white interiors that are simple and beautiful. Attention to detail makes this home feel luxurious. Well built and functional features free up space inside the home. The design is kept within a simple framework to yield beautiful results. Ready to check out the home that will be stylish for years to come? First, we're looking at the master bedroom in the home. The wooden dresser is a classic addition to any bedroom, but this one boasts some subtle style. At first glance, it might look like it’s part of a mid-century design trend. Subtle touches like the legs of the dresser and the perfectly centred drawers recall an eastern influence. This Asian style is echoed by the round mirror hanging above. This wall is directly in view of the bed. We love this design because it’s simple, clean, and inspiring. It doesn't do to wake up in the morning and see a messy closet! It’s easy to start your day off on the right foot when you wake up to see this clean and airy design. 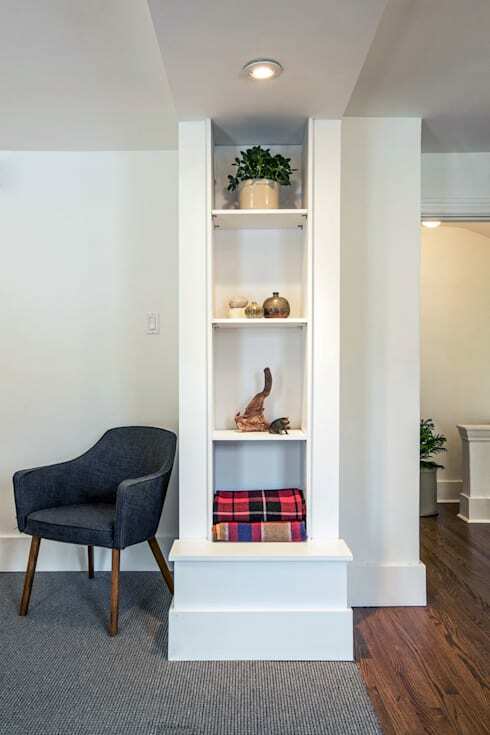 Custom built-in features in the home create sneaky opportunities for storage. These open shelves hold extra blankets, trinkets, and even a cute plant. If you have invested in your everyday objects, it’s worth it to find ways to keep them out where you can see them! These beautiful blankets add softness to the look of the room, they’re on display here on the shelf. It’s a great alternative to stuffing them in a linen closet. Look down and you’ll see how the floor delineates space in the bedroom. Charcoal carpet meets detailed chocolate coloured hardwood floors in this space. These strong materials bring a hint of masculinity to the otherwise feminine design. The bedroom is full of light. The bed is tucked cozily against the wall where the curve of the ceiling creates a warm and intimate space. Furnishing is kept simple here. It almost looks like they just moved in! Keeping things simple in the bedroom means that you have fewer distractions. 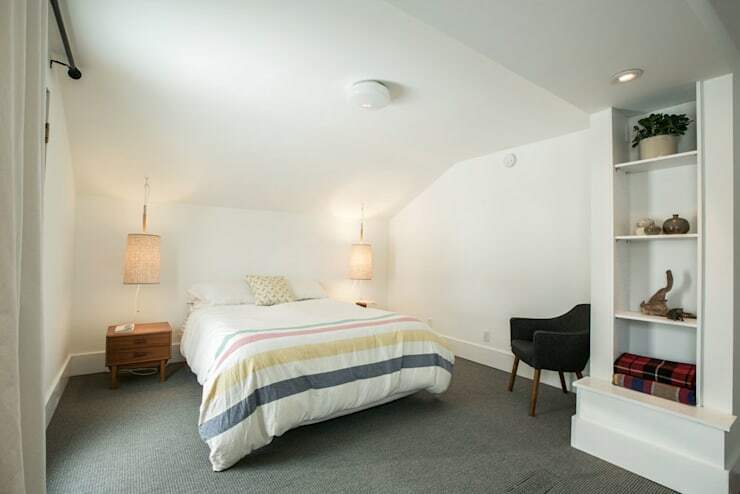 Imagine winding down for bed and being lulled to sleep in this clean and cozy space. Check out the bedside lamps! They’re a fun addition to the room because they hang from the ceiling. It's a clever reversal of the traditional bedside lamp that sits on the table! It also creates more space on the table for you to put your phone, books, and glasses. It’s a bright idea. That wall behind the dresser is simply cosmetic. Open at both ends, the closet is hidden from view of the bedroom and is easy to access. A custom railing creates space to hang clothes and shoes are tucked underneath. This open storage solution is modern yet timeless. 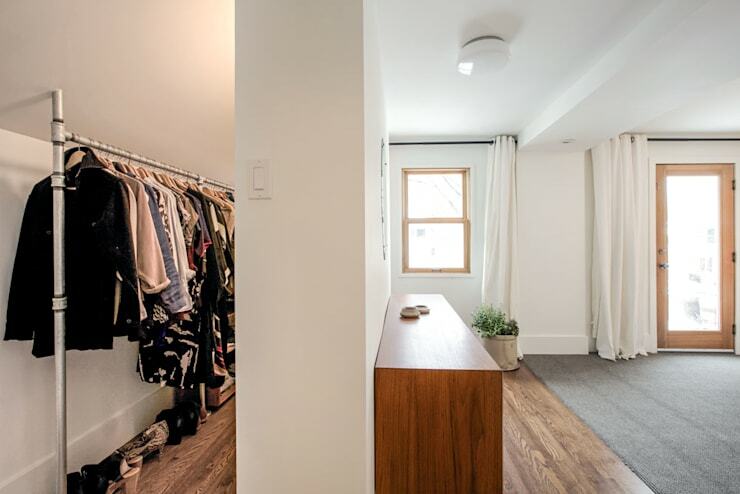 This new style of a walk in closet is sure to catch on! From this view of the bedroom, we can see the windows that brighten the room. Accented by a black curtain rod, the windows are dressed with effervescent white curtains. These will give you privacy but keep the light coming inside so you can relax and still enjoy natural light. Stepping outside of the bedroom, we’re now in the hall. This landing connects the master bedroom to the bathroom and kids’ room. There’s another integrated storage feature here that makes this home special. 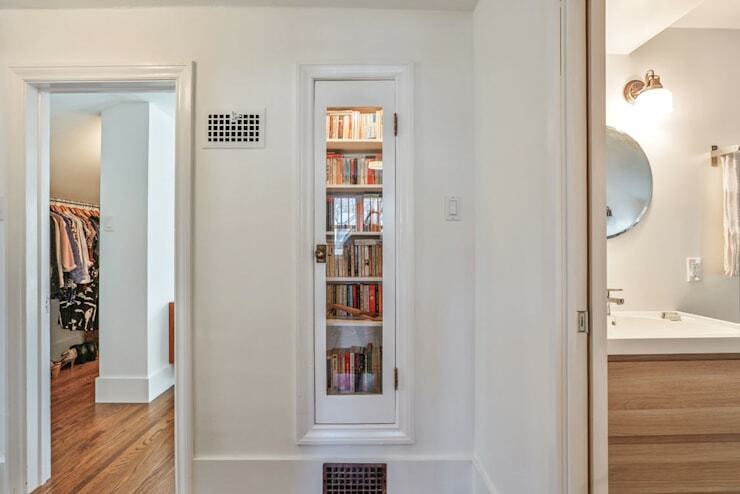 A miniature library is created inside a lit up cabinet with a glass door. This would also be a great space to display decor items. We love this charming bookcase because it gives the home more character and a touch of luxury. You don’t have to paint a room pink or draw a pirate ship mural on a wall to make a bedroom good for kids! This is a room that a child won’t outgrow easily. Simple white furniture and walls make the space seem larger and brighter. 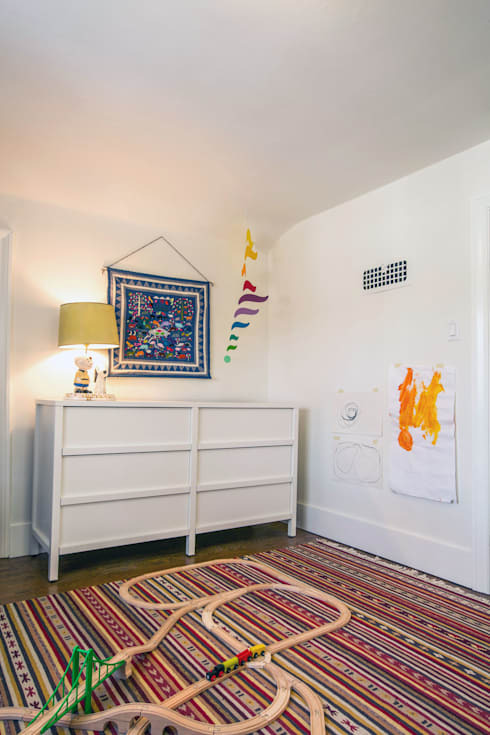 A multicoloured floor rug and decorations on the walls bring colour to the room. Looks like that rug is the perfect place to play! The last station on our tour is the bathroom. We’ve saved the best for last! The bathroom is the most elegant spot in the home. Check out the built-in storage that solves the problem of messy countertops! Looks like all the accessories are tucked slightly out of view but still accessible. This is the same approach we saw in the bedroom closet! It's an easy way to bring minimalism to your home without compromising storage space. It’s easy to relax in this spa-inspired bathroom. The freestanding tub is where you can treat yourself. 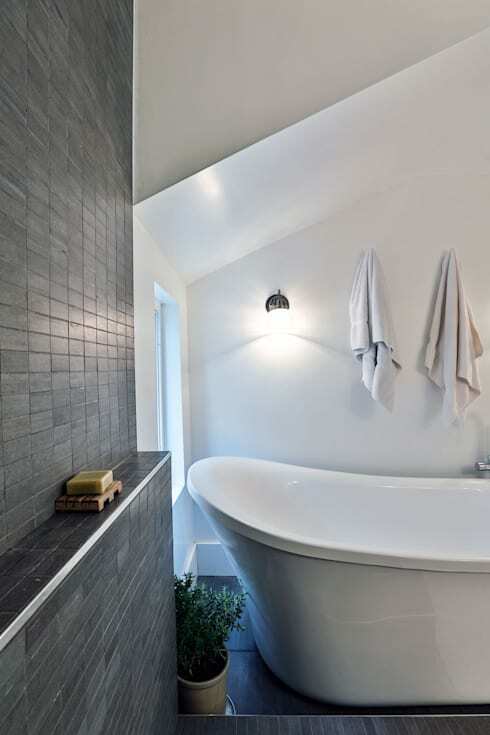 The grey stone tiling in this shower brings sophistication to the bathroom. It also brings in an element of nature that creates a spa atmosphere. The window brings light into the bathroom and sets the mood for relaxation. 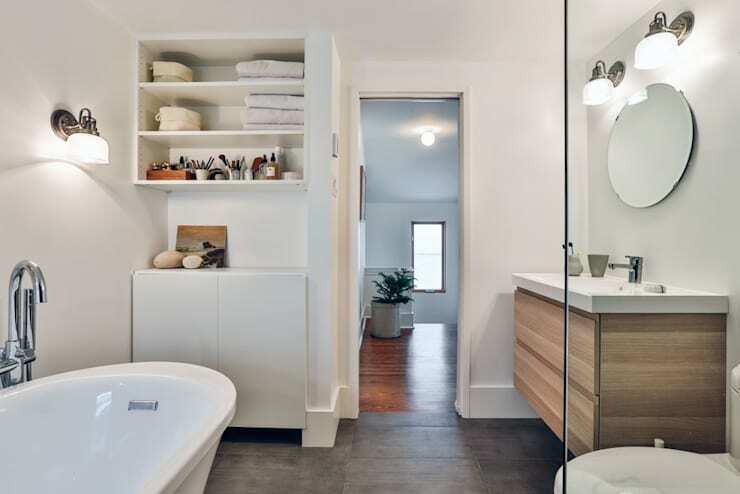 Our last look at this brilliant Winnipeg home is to take in the full scope of the bathroom. 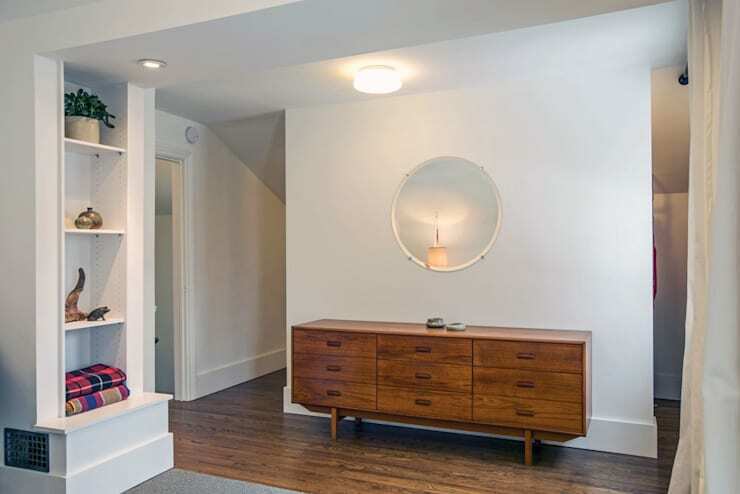 The round mirror above the sink reminds us of the one we saw in the bedroom. 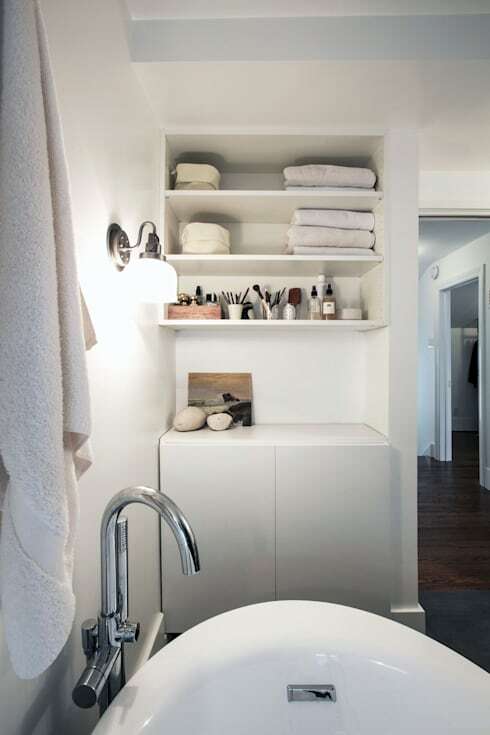 A sleek, floating wood counter brings classic modern style to the bathroom. This is the perfect bathroom where everyone can get a few moments to themselves. That ends our tour! Don’t let the inspiration stop here. Check out our feature on a home that inspires tranquility with its dove grey interiors. How do you make your style timelss?